I have been working with semi-precious stones since I was a child. This was something that my mom was always into and had lots of different kinds of stones all around. She always told me that everyone should always have a crystal quartz around them because that is the most powerful one of them all. I always have a pouch of stones or individuals laying around in different places. As I grow older I expand my knowledge on stones and their benefits. I use them in my daily life. I love wearing my healing waist beads!! The stones are always on me and as a woman, are always in direct contact with my womb. Each stone is unique and precious in its own right. Each one offers a different benefit or healing power, as I refer to it. On your journey with the stones you can tune into them and see what they have to teach you. P.S. 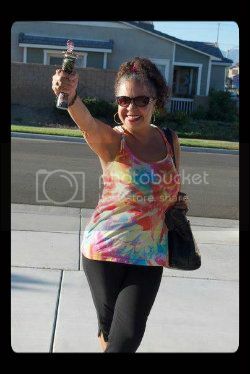 Thats a picture of my mom holding her Orgonite wand she made filled with semi-precious stones.